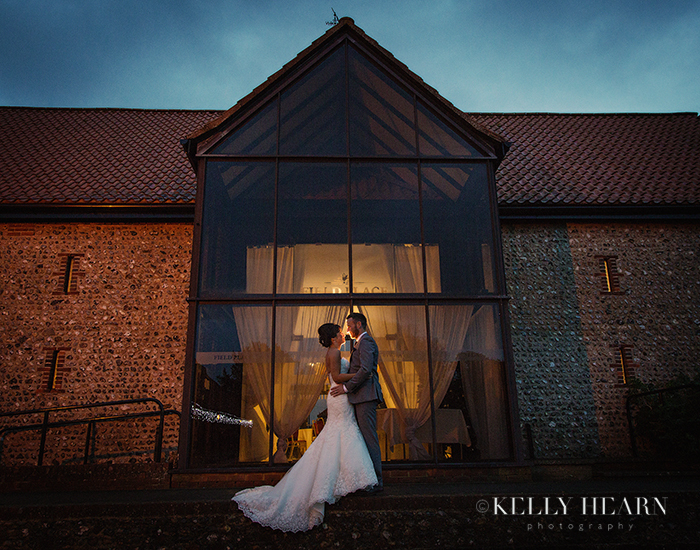 Olly and Abby chose Upwaltham Barns in West Sussex for their magical wintery wedding on 4th December last year. They were blessed with the perfect winter day; cold, crisp and clear, and though the weather was chilly, the day itself was filled with heartfelt emotion and warmth. Right from the outset I knew this couple were going to be great fun to photograph. We always had a good giggle together, and from initial meetings to the engagement shoot they would always arrive with their hilarious dog in tow, a dog they fully acknowledged looked a lot more closely related to a fox! I started out at Flintstone Cottages in Aldingbourne with Olly and his two Best Men. I managed to lure the gents out into the gardens for this atmospheric shot showing off the sweeping winter light. I love how the long shadows emphasise the rather 'catalogue model' or even 'James-Bond-esque' poses the guys are strutting! Laura and Jack presented me with a different kind of wedding shoot when they decided to split their special day into two halves, one at Field Place in Worthing, and the other in sunny Jamaica! Being the British photographer I definitely drew the short straw (! ), but I was really excited to be involved in manifesting their vision; to create some British contrast to the tropical, sun-drenched magic of the Caribbean. The Jamaican section was a very intimate affair, and Jack and Laura wanted the chance to invite all their family and friends to a big bash in Worthing not only to celebrate their marriage but to help them get over the shock of returning to the grey UK at the very end of November. The couple had really liked the modern and artistic edge to my work, and were after a striking contrast to palm trees and golden sands. 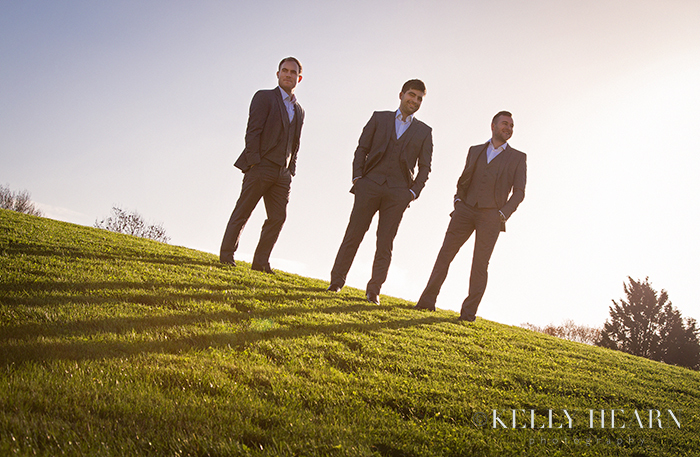 Lucky that they felt this way, as we were not blessed with the brightest of late-November days for the shoot! We were all keeping our fingers crossed for a sunset shot, but our luck was out. We Brits are not ones to be outdone by the weather though, and with a stiff upper lip we braved the rain and cold to grab a small sliver of daylight. We used the imposingly large window to frame the couple against the moody darkness of the sky, and I had my assistant crouch behind them to compensate for the non-existent sun and provide a romantic glow in this dramatic shot. Katherine and Dave married in mid October - a lovely season to capture photographically as the vibrant summer colours start melting into warmer, softer tones. The inviting autumnal setting was a fitting detail as the couple I was photographing had inclusive warm personalities ensuring all the guests and I felt very welcomed and at ease. Somehow there was a softness about the couple which allowed for a lovely calm and friendly atmosphere that day. What stood out to me the most was that this wedding was one of great taste, balance and organisation and it was clear a sense of structure had been created through all the little personal details that the couple had so carefully put into place. The couple had even chosen a Master of Ceremonies, who was a close friend of Katherine’s, to help the proceedings flow, which was a great touch. 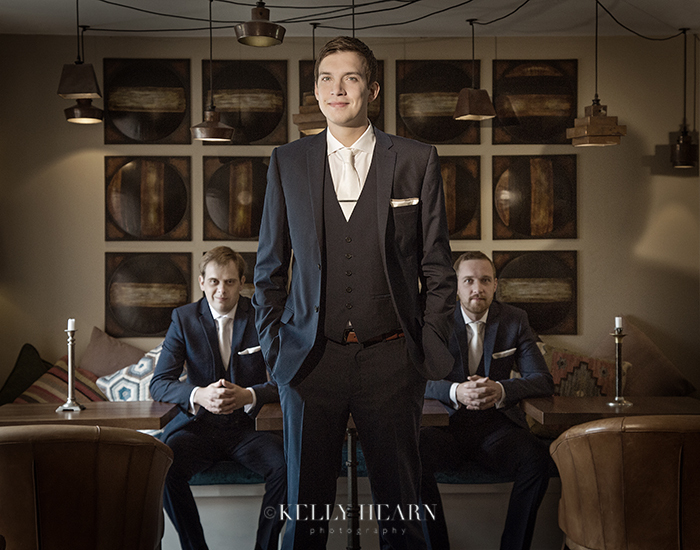 Dave and his groomsmen were at Crouchers Hotel that morning, a popular country hotel local to the Sussex wedding venue of choice; Southend Barns. When I arrived I found the boys dressed smartly in blue suits and tan brogues - both which are definitely style choices of the moment, and they were certainly wearing them well! Here is Dave and his brothers in the bar area in their on-trend attire. For an eye-catching composition I set them in a pose that offered some symmetry which is pleasing to the eye and complimentary to their overall smart and well considered styling.